One way to ensure that you get a good cup of coffee is to freshly grind your beans just before you are ready to use them. Oils escape from the beans when they’re ground and your coffee will age much, much faster than whole beans do. Dried out coffee grounds lead to less flavorful coffee. The problem with grinding as you go is that you have to devote some extra time to measuring and grinding the beans before brewing. This can be a slow and noisy (especially for those of us who make coffee very early!) process and there are times when it would be nice just to have that coffee already ground and ready to go! I don’t want to compromise flavor for speed, and neither do the people at Zevro, who came up with the Indispensable Coffee Dispenser. 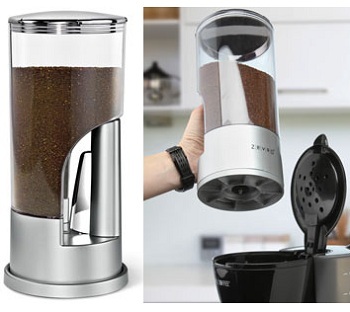 This gadget holds up to 1/2-pound of freshly ground coffee in an airtight environment. With the touch of a button, it will also dispense coffee grounds in 1 tbsp amounts directly into your espresso machine, coffee pot, or other coffee-making equipment. It does not grind the beans, so you can grind them as coarse or as fine as you like before storing them. The best thing about this dispenser is that it holds enough grounds to be useful, but not so much that you’ll end up with past-their-prime beans in your dispenser. It will keep things fresh until you’re ready for a refill. The dispensing action is also useful because it means that you don’t need to constantly open the container and let air in as you access your beans.